Mountain View Green Retreat has a rich history of serving guests and wayfarers. Built in 1890, it has served as an Inn, as a restaurant, and as a boutique shop among its many faces. It is a lovely building with amazing gardens and beautiful views of the surrounding mountains and sunsets. The rooms of the Inn are named after the many people who have owned the Inn or had a significant part in its history. Today, the Inn has been recently purchased and renovated by Wendy Roberts and her husband Michael Dillon. This new face on a historic site is intended to create a comfortable, relaxing environment, where guests can come stay and rejuvenate. To this end, healthy organic foods are offered in addition to fresh cold pressed juices. All designed to detox the body and de-stress the mind. The Mountain View Green Retreat also offers guests additional outside services to help with their unwinding. Services such as massage therapy, acupuncture, yoga, meditation, spiritual discussions and magnet therapy are made available for those who would like to partake. Otherwise guests can simply enjoy the beautiful scenery and relaxing atmosphere. No matter what your preference, Mountain View Green Retreat will help you rejuvenate your mind, body and spirit. Mountain View Green Retreat is the ideal location to unwind and relax. You can stroll along our backyard gardens, swing on the tree swing for two hanging from our ancient tree. Or sit on the porch with a beautiful view of the hillside and read a good book while watching the local wildlife scurry to and fro. 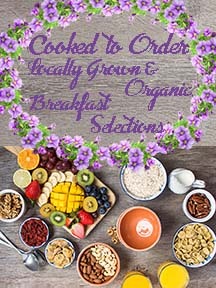 Enjoy our amazing breakfast buffet made with organic locally grown items. All entrees are freshly made at by our loving chefs and designed to detox your body, recharge your spirit and reinvigorate your mind.